Our club nights are on Tuesdays from 8pm. Like most sports clubs, we rarely miss a club night, but if you are travelling some distance it is advisable to check beforehand. As parking is difficult and, more importantly, the game is best enjoyed with several pints of real beer, the use of public transport is recommended. The nearest station is Hampstead Heath on the London Overground. The nearest London Underground stations are Belsize Park (followed by an uphill walk) and Hampstead (followed by a downhill walk). The area is also well served by buses. 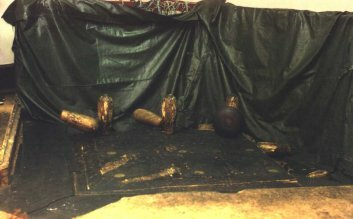 Unlike other traditional games of nine pins, London Skittles is played not with a ball but a cheese. This is thrown through the air, without bouncing, at the front pin some 21ft away. 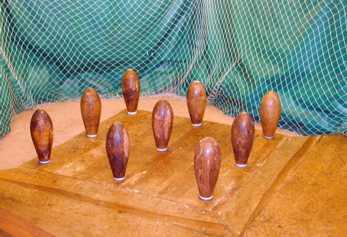 The game is scored by counting not the number of pins knocked down, but the number of throws to clear the frame. The player has a maximum of four throws in which to do this. The best score is therefore one, known as a floorer. The worst is a five, scored when there are still pins standing after four throws. The 'par' score is three, which only the best of today's players can average. The skittle alley is situated in the cellar of the Freemasons Arms, a pub/restaurant in Hampstead, London. The player starts from the back of the run, 21ft (6.4m) from the front pin. The nine pins stand in diamond formation on a frame 54in (1.37m) square. Both pins and frame are traditionally made from hornbeam, a hardwood related to beech. This object, named because of its shape, is made of lignum vitae, a dense tropical hardwood. Cheeses vary in size and exact shape, most weighing about 10lb (4.5kg). Novices are never short of advice on how to throw. They get a constant stream of it, much of it conflicting. The following is the usually accepted technique for right handers. Left handers should reverse right and left throughout. Stand at the back of the run on the left ('at home'). Your feet should be pointing straight down the alley, so that the cheese is in line with the front pin. Swing the cheese back and forth a few times before throwing. It should swing like a pendulum - the force of the throw comes from the swing not from the elbow. Allow the cheese to rest on your fingertips - if your fingers are curled round it, it will tumble end over end as it flies through the air (this is called 'a flying fornicator' in some circles). It should fly through the air at an angle to the direction of travel with a slight spin on it. The point to aim for is the right hand shoulder of the front pin. Now the moment of truth. Step off with the left foot, swing the cheese forward and release it before the right foot touches the ground. Take a further step ('follow through') to ensure a smooth action. If you've got all that right, there should be an explosive crack, the cheese should be lying on the back plate and all nine pins should be down. This rarely happens however, so you are now faced with clearing a 'broken frame'. This is an art in itself. Many of the combinations of pins which are left after the initial throw are given names, such as the Novices, Waterloo or the dreaded Gates of Hell. Different techniques are required depending on the leave (the combination of pins left). So much so that we have a Broken Frames Competition in which players attempt to clear such combinations of pins. The score is taken as the number of throws plus the number of pins left standing (in other words it is not necessary to throw for a single pin - it is assumed that you would get it). Up to four throws are allowed - if any pins are left standing, five is scored and that doesn't happen very often (... does it chaps???). Floorers (knocking down all the pins with one throw) are rare. Somewhat more common are eight pins, knocking down all but one. This of course automatically scores two and is recorded as 2* (two with a dot). Usually two players play a game over seven legs or 'ends'. Play alternates, so player one sets a score and player two replies, then player two sets and player one replies and so on. This confuses beginners. The outcome is determined by the number of ends won (e.g. a two beats a four). Now this is where complimentary scores come in. Say I score a two. If you then reply and throw twice still leaving some standing, you have now lost and there is no point in continuing. If the remaining pins are gettable with a single shot, you are awarded a complimentary three (recorded as 3c) without having to take the shot. Somewhat more difficult to explain is the call of 'four (or three) for the pot' which you will sometimes hear. If you really care by now, look in the Glossary. A player's standing is normally expressed in terms of a number above or below the par score of three. Thus in the game shown above Player A is 'one under'. He is level until leg 3 when he goes one under, then he goes level again at leg four. The floorer at leg 5 puts him two under, where he remains at leg 6. The final four puts him one under. Player B is two over. This is all about skittles but the club's called the Hampstead Lawn Billiards and Skittles Club. What's Lawn Billiards? Don't ask me, it hasn't been played in decades. It seems to involve poles with rings on the end. It was also called Pell Mell and King Charles II used to play it. We play for two knockout cups each year, one a handicap competition, the other played off scratch. Also there's the London Skittles Championship played annually on a Saturday in April. This is open to individuals regardless of club affiliation (though this is a bit academic as we're the only club with a functioning alley at present). This competition is also known jocularly as the World Championships. How long has the alley been here? The alley has been in its present location since the pub was rebuilt in 1934. There has been a skittles alley at the Freemasons Arms since the nineteenth century though. It was previously located at ground level in an outbuilding rather than in the cellar. Can I bring my work colleagues/mates from the local/club/Aunty Ethel down here for a match? You are welcome to bring people down to play as individuals on club nights. You can also arrange a skittles night for a group of friends, workmates etc. The club makes a charge to contribute towards the rolling programme of replacing the equipment. Why do you put back up the odd pin that has been knocked over? Sometimes a pin is struck by a cheese or a dead pin that has gone off the frame and then bounced back on. This is invalid and the pin is stood back up. Sometimes there is a heated debate about whether a particular pin was validly struck or not.